If you’ve found that your aquarium at home needs constant care and maintenance it might be time to take another look at your filter. New aquarium lovers often do a ton of research and are then left with a choice that might not be the best for them. We’ve pooled together the top 14 best aquarium filters out there and have reviewed each. We’ll go through what the best value is, and which could be the best one for you! What type of filter is best for you! 1. Why Do I Need a Filter? 2. What Size of Filter Do I Need? 3. Do I still have to clean my tank when using a filter? This is a canister system that sits outside of the aquarium and has three separate filter media trays. So the biological, chemical and mechanical functions are all present but captured in different areas which can make cleaning a little easier. The system works with a quiet flow system and is built with quality materials. The setup is easy, which is a huge relief for handling a canister filter especially if you haven’t used one before! What is most notable here is that this system is made for 75-gallon tanks. Aquaflow has other systems built for varying sizes this is one of their top models and very highly rated. Three separate compartments for each filter type. This filter is very quiet. If you go with this choice you will hardly hear it and if you do, it might be a sign to check it for large debris. The hoses are of pretty standard quality and work well for both fish and turtle tanks as long you fill the filter appropriately. The piece that is supposed to function as the surface skimmer doesn’t sit in its compartment as well as the other two filters do. Another aspect we didn’t like was the very vague setup directions. Although the directions available on YouTube are helpful they are hardly the go-to when you’re setting up a new filter. 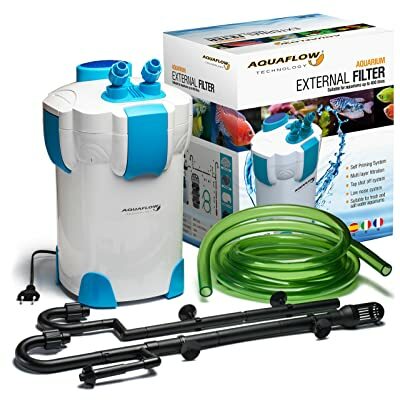 As you enjoy caring for your fish this filter can assist in keeping your tank clean and improving the aesthetics if you’ve previously used back-hanging filters or cartridge filters. Because it sits underneath all you see are the two tubes that come up into the back corners of the aquarium. These tubes deliver a high-quality aeration of the aquarium helping the beneficial bacteria distribute evenly and breaking up the ammonia caused by your fish. This is a biological filter that has a chemical filter mix. There are two, changeable, carbon filter cartridges that help with keeping the water clear and containing any smell. This is a great option for 50-gallon tanks, but not for anything bigger. We did like that the filter comes in pieces so you can adjust for the size of your tank in terms of length and width, not just gallons. It is also a great bonus that you can’t see any of the filters except the tubing once the gravel has been laid in. Well, the carbon cartridges are a double-edged sword. While they help maintain the cleanliness of the tank they also make it a pain to manually clean the tank. That’s the only con we could find here is that the maintenance of the filter can be time-consuming. Overall the visual aesthetic makes this filter an option that many go for. If your aquarium is in a highly trafficked area and you don’t want the loud bulk of a power filter then we would recommend this. However, it isn’t our top choice for these reviews. This filter is made for tanks up to 75-gallon tanks that are set up for fresh or saltwater. It can easily handle heavily-stocked tanks that need a lot of daily care. 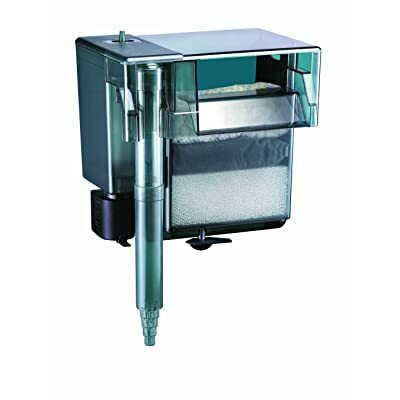 It operates like any other canister filter forcing water through the filter media setup in different departments. Includes all the hoses, gaskets and trays necessary to set up. We like that this filter was really designed to handle aquariums with a large-volume of fish. Often when you’re getting a power filter or under gravel filter, for even a standard sized tank you’ll quickly find that too many fish in the water and the filter just doesn’t hold up. Canister filters are well-known for handling large tanks and this one is no exception. It works well up to about a 75-gallon tank if you have anything larger than that we don’t recommend it. This unit is big! It’s about 13” in length, by 10” wide and about 15” high. This means it won’t fit comfortably under most cabinets that are meant for 75-gallons tanks. It really isn’t size proportionate to the amount of water it’s servicing. What does make this filter stand out is the adjustable spray bar. It isn’t a feature you see very often, and it can be great to monitor if a high-pressure outflow is disrupting your fish. Unlike the other filters on this list, this filter is completely internal. An added bonus? The Aqueon Quietflow says it can handle up to 40-gallons! For an internal filter that is pretty good. We enjoyed that there was a reliable internal filter available for aquariums past the 20-gallon range. There are also cartridges for this which makes it easy to clean. Although there are some size variances it tops out at 40-gallons. Which is great for some small tanks but for most enthusiasts it won’t be enough. This filter does stand out among other internal filters by providing a high-quality filtration system that uses biological, chemical and mechanical functions. Fluval is part of the fishkeeping products of Hagen group, and they have introduced a new series of external canister fish tank filters. The mid entry-level model (206) in the series features a flow rate of 206 US GPH (780 L/H and it boasts of filtering an aquarium up to 200 liters. Designed on the success of Fluval 205, Fluval 206 provides an improved filtration performance and functionality that creates very healthy and clean aquarium. 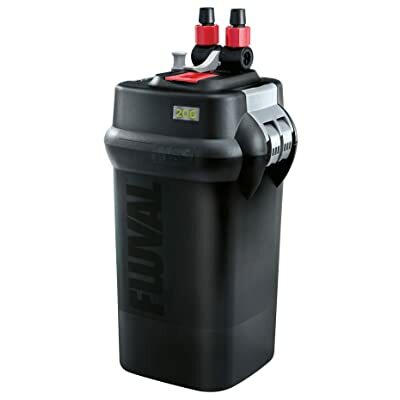 The Fluval 206 external canister filter offers a lot of practical benefits such as faster setup, quieter operation, less maintenance frequency, and better filtration. 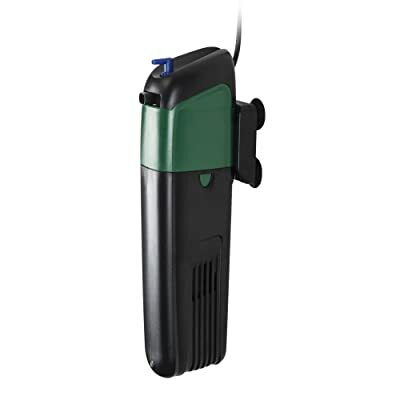 This aquarium external filter helps to make fishkeeping very easy and worry-free by delivering an extraordinary range of additional features such as patented Aqua-Stop Valves for stress-free disconnection of hose, single-motion lift-lock clamps for easy maintenance and cleaning, and several filtration baskets (removable) which are pre-packed with all the necessary media for biological, chemical, and mechanical filtration. Furthermore, with all these features associated with it, it is still pocket-friendly. 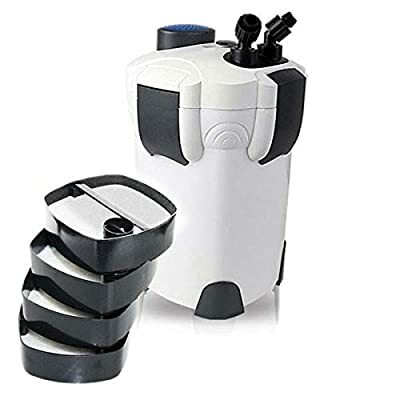 This affordable aquarium filter features a unique square-shaped canister design that holds thirty-five to fifty percent additional water than small sized round canister filters, enabling better flow of water through an intricate cleansing path which exploits contact with the filtration media. The Hydor Professional External Canister Filter is one of the latest in the industry, but it has been making waves for some time now. This series of external canister filters are the first external canister filters the company has produced, and the outcome is definitely something worth considering for small tanks. This filter has an attractive design, and it is well-constructed. With a rectangular shape adopted from the design of canister filters styled in Japan, this Hydor Professional External Canister Filter 250 can hold a large volume of filtration media than canister filters with round design. It also features a highly efficient motor and soundproofing for almost zero noise operation. It also has media trays which are flush against the sides that allows water to pass through the filtration media. With this aquarium filter, you do not have to worry about your tank creating another channel to pass without being filtered. It also features an expandable spray bar that allows you to customize the flow of water. Powerful flow rate and efficient, quiet operation. Replacement parts can be scarce since it’s a new filter. Penn Plax Cascade 1000 Canister filter is one of the finest large aquarium filters out there. 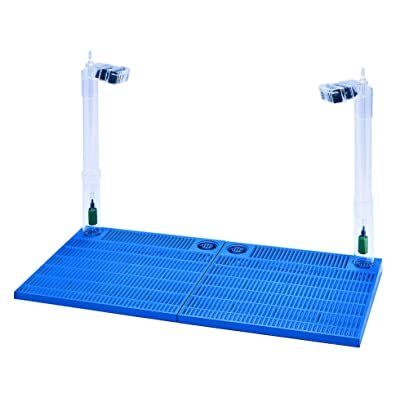 It is a heavy-duty external fish tank filter for use with large fish tanks. The filter offers the sought after combination of chemical, biological, and mechanical water filtration. 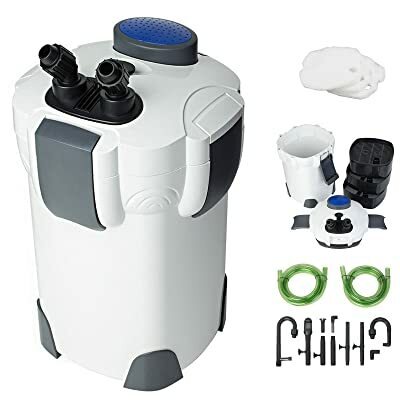 It also features tubing connectors (which are easy to disconnect) that can control the rate of filtration, and some locking clamps to ensure a water-tight and secure fit. The Penn Plax Cascade 1000 Canister Filter can only handle a tank with a maximum volume of 100 gallons at a rate of 265 GPH (gallons per hour). If you are looking for the most powerful aquarium canister filter, then this may not be your speed. But if you are looking for solid mid-level aquarium canister filter, then this might be the option you seek. Also, this filter is very quiet during operation, and if it’s inside a cabinet, you will never hear the sound. 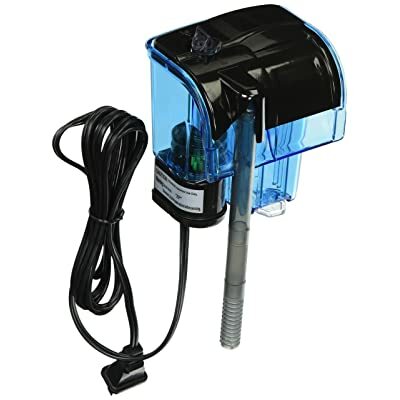 This aquarium external filter has a lot of muscle to keep your water looking great. The tubes are a little bit tough to connect, and the priming is also not as easy as indicated in the instructions. It also has a floss pad that removes fine particulate matter and an activated carbon media that removes impurities and toxins from the water. Priming is a big issue. Do you want to improve the living environment of your fish? Do you want your fish tank to look crystal clear and healthy? Then you might want to give COODIA Internal UV Sterilizer Filter Aquarium a try. This internal ultraviolent sterilizer filter is a submersible combination of the power head and UV Sterilizer. The Ultraviolent radiation functions as the sterilizer by aggressively attacking and terminating the nucleic acids and DNA in bacteria and algae. When the DNA is destroyed. The nuisance bacteria and algae cannot reproduce any longer and they will die off eventually, making your fish tank as clean as new. This filter is designed to always keep your tank clean and prevent the formation of greenish substances which are detrimental to the well-being of your fish. COODIA filter uses UV to simply and effectively control free-floating algae and harmful microorganisms. It also gets rid of impurities in the water by filtering out the ultraviolet light. It has an inbuilt pump that directs the waterborne microorganisms past the ultraviolent-C lamp for clear and aquarium water. The wavelength of the ultraviolet filtration is 254nm, it is simple and quick to install, the wattage of the pump is 5W, the wattage of the UV light is 5W, and the filtration pump is 130 gallons per hour. 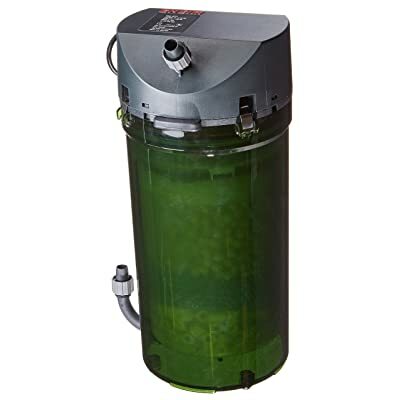 This aquarium canister filter features a special ultraviolet sterilizer with a power of 9 watts for killing germs, bacteria, algae and other types of microorganisms that could cause harm to the fish in the aquarium. This Polar Aurora 4-Stage External Canister Filter has a flow rate of 525 gallons per hour (GPH) or 2000 LPH (liters per hour). The wattage of this canister filter’s pump is 55 watts. It also features a set of filtering media (included in the canister filter) which makes it outright ready to use. The ultraviolet sterilizer that comes with the filter helps to remove spores of algae and other bacteria in the water. It has a 4-stage process for filtering water and an incredible external design. This canister filter has a UV kill switch and the power rating of the filter is from 110V to 120V at 50Hz to 60Hz. It has a height of 18-inches, and it is designed for medium and small sized tanks. The filter is a great option for 150-gallon fish tanks. 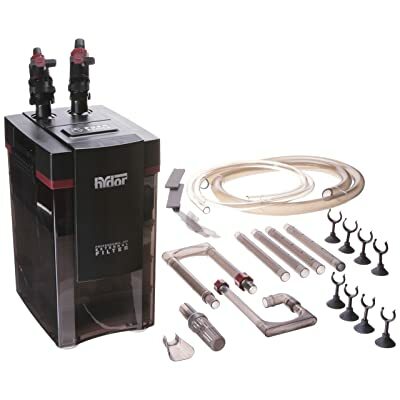 It features a quick-to-disconnect coupling on the surface which lets you separate the hoses from the filter without having to empty it. The filter trays have practical handles, and they can be filled separately. The instructions included are really helpful. The EHEIM Classic External Filter is one of the most used, most recommended, and most popular external aquarium canister filter out there. It has been around for a long time and it stands out when it comes to aquatic products. The EHEIM Classic 250 External Canister Filter has a rating of 66 US gallons, which means 250 liters. This canister filter handles about 116 gallons per hour or 440 liters per hour, and its power rating is 8 watts. It comes with a complete setup kit, including hoses, spray bar, filter, and valves. The filter also has other accessories which are not included in the package. EHEIM Canister Filter comes with instructions that make the installation very easy. It is also known for its soundproofing which almost doesn’t make any noise. It is very quiet during operation. The flow is very strong and the spray bar can be used to create good circulation or/and oxygenate the water. It also comes with actual biological filter media, and this helps in establishing a stable circle. If you are looking for the best aquarium filter for small tanks, then this might be a great option as it has the necessary features to keep small sized aquarium tanks running. The EHEIM Classic Externals Canister filter has a series, so you can opt for higher versions for larger aquarium tanks. The MarineLand Filter Systems 400B is a powerhouse of a biological filtration. The filter comes with two Bio-wheels that filters out harmful bacteria and chemical from the water, keeping your fish healthy and happy. 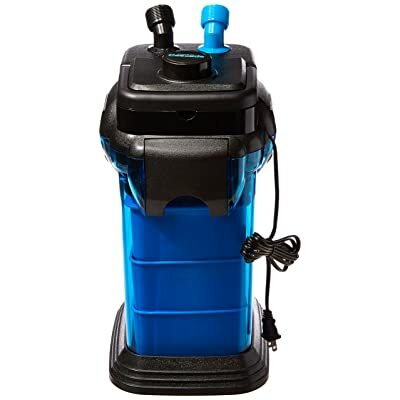 This HOB aquarium filter also features a 3-stage process filtration, high flow rate, efficient and quiet operation, a unique dual-pump design, and an adjustable intake. If you are looking for a filter that is powerful and efficient in biological filtration, then you should give this canister filter a try. This filter also offers chemical and mechanical filtration via its four filter pad slots. It can filter 400 gallons per hour, and it is a great fit for tanks up to 80 gallons. This filtration system has two pumps. The first one draws water through the intake tube and passes it through the filter, while the second one draws water into spray bar and sprays the Bio-wheels; this makes them spin through the water. The Bio-wheels are one of the major features of this product, as they are one of the most effective ways to step up the capabilities of biological filtration of your aquarium. Spray bar can be clogged with dirt, preventing the wheels from spinning. Can’t use tap water to clean the Bio-wheels. AquaClear Filters have been in the market for a long time now, and a lot of people consider them to be the best HOB filters because they are reliable, efficient, quiet, and they work great. This Filters are in different sizes. The AquaClear 20 Power Filter is a small hang on back (HOB) powerful freshwater and saltwater aquarium filter. This HOB aquarium filter is rated at 20 gallons, and it can handle 100 gallons per hour. It also comes with three types of filtration media which are biological, mechanical (small sponge), and chemical (carbon). You can as well wash the bio rings and sponge and reuse them as many times as you want. This canister filter is also appreciated for its noise level – it is almost silent. It is very quiet and you can hardly hear the sound when it’s running. It comes equipped with Activated carbon, Cycle Guard, and BioMax for superior water quality and continuous biological filtration. The filter is also easy and quick to set up. This aquarium filter offers a clean and healthy environment for your fish because of its multiple processes of filtration. It also minimizes your cost of operation because it is energy efficient. It also features an AquaClear form that serves as a sponge in trapping debris. Dirt can clog in the propeller box, which would require regular cleaning. The Penn Plax Cascade HOB Aquarium Filter is a large-chamber HOB (hang on back) filter which was designed for style. This filter could be a great choice if you are looking for an aquarium filter that looks easy on the eye. It features a Bio-Falls quad filtration system (4-stage process filtration) that enhances beneficial bacteria health growth. The Bio-Fall is one feature that is rare in aquarium filters. 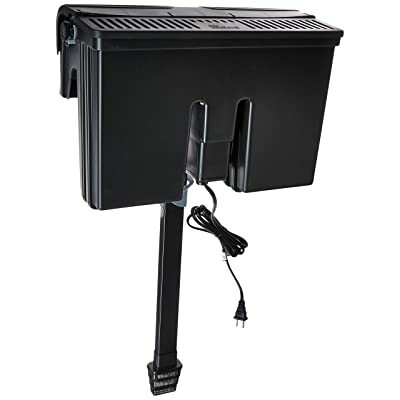 Also, this hand on back aquarium filter comes with several bonuses including the activated charcoal that helps to get rid of harmful contaminants, discolorations, and toxins. It also comes with a filter sponge that provides a better place for beneficial bacteria to populate and thrive, and beneficial bacteria are one crucial aspect of a healthy fish tank. The Penn Plax Cascade HOB Aquarium Filter comes in various sizes such as Cascade 20, Cascade 80, Cascade 100, Cascade 150, Cascade 200, and Cascade 300. The cascade 20 handles a flow rate of 20 GPH, and it is designed for tank sizes up to 7 gallons. If you have a bigger tank, then you can opt for a higher version. This HOB aquarium filter also features an almost zero noise when it’s in operation. It also has an adjustable intake tube and adjustable flow rate that enables you to manipulate the filter to suit your personal need. 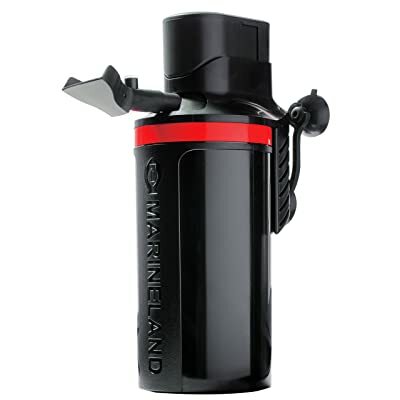 MarineLand Magnum Polishing Internal Canister Filter provides crystal clear water. This internal aquarium canister filter features two refillable chambers, which will enable you to customize filter carbon or media. This filter adopts a powerful 3-stage filtration process to always keep the aquarium clean. Its water polishing option tends to get rid of fine debris in the tank, making the water crystal clear. The setup of the motor is easy and quick, and there isn’t any need for priming. This filter can handle 290 gallons per hour, and it more suitable for tank sizes of up to 97 gallons. It is designed in a way that it is easier to clean and use. The motor starts pretty easy and it can last you for a long time if well-maintained. Based on its features, the price of the filter is fair. One of the most significant advantages of this filter is that it prevents any kind of premature blockage, and this helps to keep the water constantly clean. It also incorporates mechanical filtration, biological filtration, chemical filtration, and water polishing. You can also convert from continuous 3-stage filtration process to a micron cartridge. Extreme caution is needed when replacing the media trays, as you could tear or misplace the rubber gasket. When you’ve just started an aquarium it seems like the costs mount up really quickly. The tank, the gravel, decorative rocks, not to mention the fish! But, the best filter doesn’t always mean the most expensive. You need a filter that will purify your tank consistently. Extra food, debris, fish waste and algae are all factors in how quickly a tank gets dirty. A great filter helps process the extra food, the waste, and anything else that can grow or find its way into your tank. There are a lot of variables in choosing your filter but don’t feel overwhelmed! The combination of this list above is what is going to be your best value. One of the people’s biggest concerns, when they take on caring for fish, is that they won’t be able to afford a high-quality filter. You can find great filters in a variety of different budgets. Although great filters can quickly become expensive you don’t have to break the bank. Why are there so many different types of filters? We’re going to tackle these questions right now! To understand the different types, it helps knowing how each functions. This is the most common type of filter that you see on aquariums. The mechanical filter works to remove all sorts of debris from the tank by manually processing the water. Many people don’t like that the filter runs continuously. There is also the concern that once the water is purified it doesn’t stop functioning. Your tank will be consistently clean though, and well-aerated as well. Both of these factors work to deliver good conditions for great fish health. This is the most recommended type of filter; however, it doesn’t mean that you never have to manually clean your tank. Usually, you have to use some blend of chemical filters because of the type of water we put into aquariums. When you’re filling your tank odds are you are using water that would be suitable for humans. But, doesn’t mean it’s safe for fish. Our water has a ton of metals and chemicals added to it. Some are required by regulations, such as chlorine, and others like hard metals navigate into the water through a variety of different sources. Using a filter you can remove these impurities to ensure that your fish are in safe to breathe water. Chemical filters are often the top choice for cleaning up these impurities as you can track it regularly and adjust the levels accordingly. Biological filters rely on using aerobic conditions to help rid the tank of ammonia which is deadly to fish! Ammonia is also something they produce naturally as they process water through their gills. This function of the filter can be really difficult to control and maintain. If you know that you’re going to have the time and dedication to your tank, go for it! The biological filter option is a more natural option that relies on bacteria, nitrates and plant material to assist in keeping your tank clean. Now, if you don’t have the time we don’t recommend biological function filters very often. Getting a little more specific than how the filter functions, this is how you’re going to see filters are explained online or in a pet store. There is a lot of variety across them but as you read through you’ll be able to quickly distinguish which are possibilities for you. If you have a small tank, this could be your best bet. An internal filter works driven on air and can be used on a ton of different fish types. By driving air through the filter it aerates the water, breaking down the ammonia and waste created by the fish. Internal filters are very small, which is why they’re ideal for small tanks. If you have a ten-gallon tank you keep in the bedroom or a lobby, this is a great option. The water is kept clear, and your fish will have the conditions necessary to be happy and healthy. Another type of biological filter is the under gravel filter. The filter is a system that sits underneath the gravel on the bottom of the tank. Then it shifts the water underneath the gravel and creates an environment where beneficial bacteria can affect the entire tank. Some under gravel filters have cartridges that contain activated carbon. The activated carbon is a form of chemical filtration that helps pull heavy metals from the water and further purify the tank. Overall these types of filters aren’t a bad choice but they’re not usually the first choice. Again, if you have the time to spend monitoring the state of your tank knowing you have a biological filtration system it can be a good choice. Wet/Dry filters get their name from their ability to effectively provide a biological filtration system when exposed to either air or water. The filter creates a near perfect environment for beneficial bacteria in your tank. Wet/Dry filters are usually a top choice for saltwater tanks. The biological filter for saltwater fish is often much more beneficial than the option of only a purely mechanical or purely chemical filter system. These are the most common types of filters you see in homes and businesses. They are low maintenance and provide the best mix of chemical, mechanical, and biological filtering for your fish. Power filters sit on the back of your tank and run continuously. They often have cartridges which can pop in and out easily. So if you know the filter needs to be replaced it can be done in a manner of minutes while you can schedule time for your deep, manual cleaning on another day. Power filters are a great option for a variety of different aquariums and many types of fish. This type of filter is very space exhaustive. Not only do they demand a lot of space but they require a lot of maintenance too. The cartridge itself houses multiple filter units. So within the canister, there are usually biological, chemical and mechanical filters. This means that when the filter needs to be cleaned each aspect of the filter must be handled differently. However, canister filters are often chosen by experienced aquarium keepers for their power, flexibility, and resilience. We mentioned before that short list of things to consider. Now, we’re going to break it down a little more. You understand the different types of filters available to you and how they function. So hopefully you as you read through this you can identify how your needs affect which filter could be best for your aquarium! Overall if you’re putting together or caring for a saltwater tank, the diversity of the canister filter can’t be beaten. There are different size options available. If you are newer to caring for a saltwater tank and a canister filter seems like a tough task to take on, there are many power filters that are great as well. For most people who are maintaining a freshwater tank, you have all the variety available to you. Fish in freshwater tanks often do well with aeration systems, power systems, and even under gravel filters. Filter size in comparison to your tank size has to be taken into account on a case-by-case basis. Why? Because some filters aren’t meant for specific sizes or size ranges. The great thing is that this is usually one of the most prominently displayed items on a filters packaging. You can quickly reference the packaging and determine if it is a good fit for your tank’s size or not. This is not a deciding factor that you should ever spend a lot of time on. If the filter you’re looking at doesn’t have your tank’s size on it, move on. There are a ton of other great filters out there! This is the big question, isn’t it? Well, it’s good to know that many filters use a combination of the filter functions to deliver a mix that is best for your fish. However, we most often recommend power or back-hanging filters. They’re easy to maintain and usually last for a long time which makes them a top choice for new or seasoned aquarium caretakers. After power filters, you branch into two different sections: the very large, and the very small aquariums. For large aquariums, canister filters are usually the best value and deliver a high-quality environment for your fish. Keep in mind they can be a pain to maintain! For small aquariums, keep it simple. An internal fish tank filter is usually more than enough to keep your small colony of fish happy and healthy. A filter is necessary if you want to keep your fish alive and healthy, as it will help to get rid of wastes produced by fish and keep your aquarium water clean. It will also save you the stress of cleaning the tank regularly. There are various sizes of aquarium filters, and the size you will need is actually dependent on the size of your tank. Yes, you do. You still have to clean your tank once in a while. But with an aquarium filter, you won’t have to clean as frequent as you used to because the tanks will most likely be clean always. Our clear winner is the AquaClear power filter. AquaClear is a well-known and well-loved name in aquarium filters. This power filter is a back-hanging model so you do see it but the aesthetic isn’t bad. It uses multistage filtration to purify the water in the aquarium and is designed to produce as low of an effect of the water being returned to the tank as possible. The multistage filtration ensures that the beneficial bacterium isn’t depleted too much through the purification process. 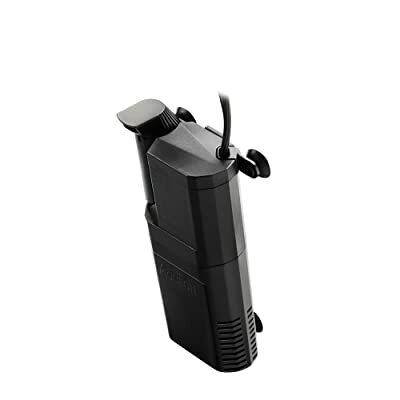 The thing we liked was that the filter itself has three different compartments that perform three different functions. The bottom helps to contain debris and direct water distribution back into the aquarium. While the middle section is the carbon filter adding in that chemical function. The top section has ceramic, BioMax rings that help build up beneficial bacteria. It really is an all in one filter that is meant for multiple tank sizes. Overall the AquaClear is a powerful, power filter. It is a trusted brand that consistently delivers high-quality filters. I have four glowlight tetra and three orange….they hang out together some but not much. I have a 55 gallon tank with guppies, catys and plecostomas…also, my neons aren’t very active and seem fat….is it due to the wrong filter i am using. currently i am using just a power filter in my tank.